so good and put together under 30 mins! 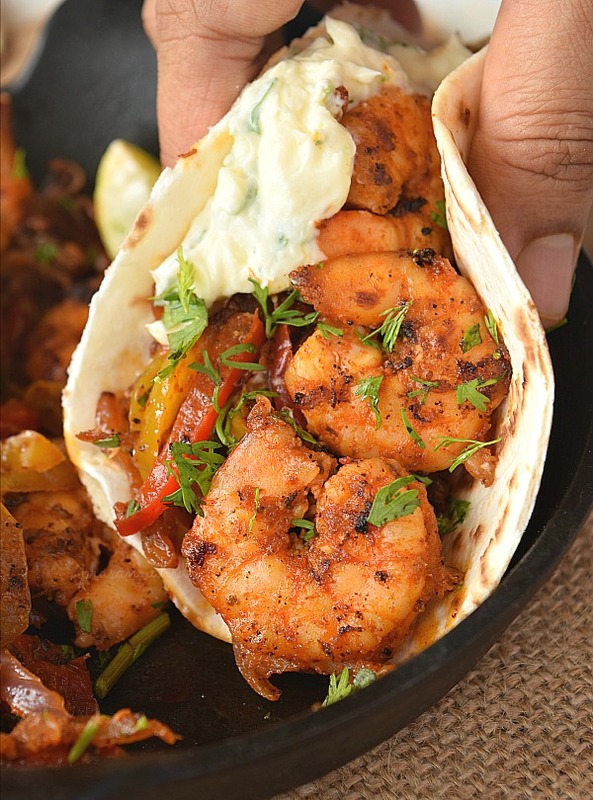 Here is another amazing recipe that will fix all your Lunch/Dinner worries in no time with these easy,spicy,delicious Skillet Shrimp Fajitas! 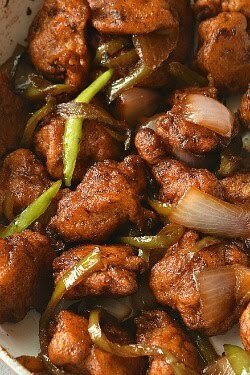 This recipe is very easy to put together under 30 mins ,specially when you have everything handy. If you love Mexican food then this fusion Tex-Mex recipe will be on your list when you have sudden cravings for spicy food. Of course you can adjust the heat level as per your tolerance. I prefer spicy food so please adjust the spice level as per your tolerance in this recipe. Whenever we crave for Mexican Food then Fajitas are my favorite menu to order. 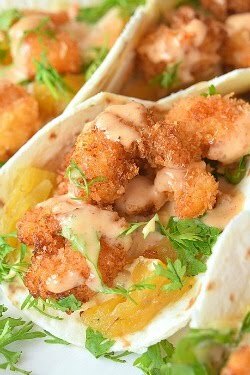 Of-course I love Taco and Taquitos too but the Summer feeling comes when we eat some crazy good Shrimp recipes. 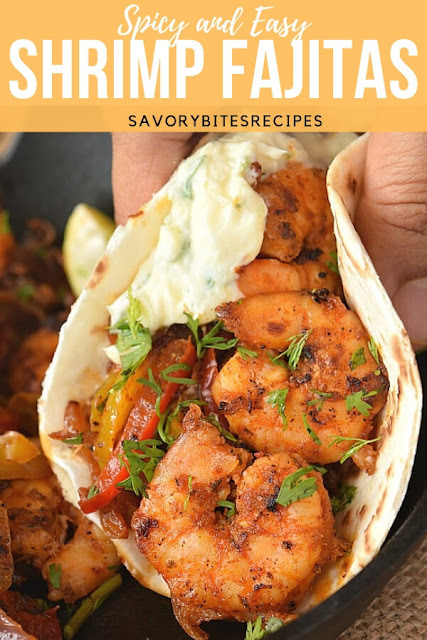 These Shrimp Fajitas are so easy to put together and its a great portable meal which you can take for picnics/getaways plus for a pool-party. What seasonings are used in Shrimp Fajitas? These are the primary spices used in this recipe. You can add or skip any spices as per your choice. What are the ingredients used in Shrimp Fajitas? Shrimp: Use fresh shrimp for best taste. Alternatively use the frozen,pre-cleaned shrimp for faster cooking time and ease of use. Use medium sized shrimp in this recipe. Red and Yellow Bell Peppers: These are sweet in taste so I prefer using Red and Yellow but you can use Green Bell Peppers too. Tortilla/ Taco Shells: Use Soft Flour Tortilla or Corn Taco Shells as per choice. I preferred soft flour tortilla,6 Inch one's. Sour Cream + Cream Cheese Sauce/ Topping: I have used a combination of sour cream and cream cheese,along with chopped cilantro,a pinch of salt,sugar,lime juice to top on the fajitas. In a mixing bowl add Shrimp,veggies,lime juice and all the seasonings mentioned. Toss well as to coat everything well with the spices. 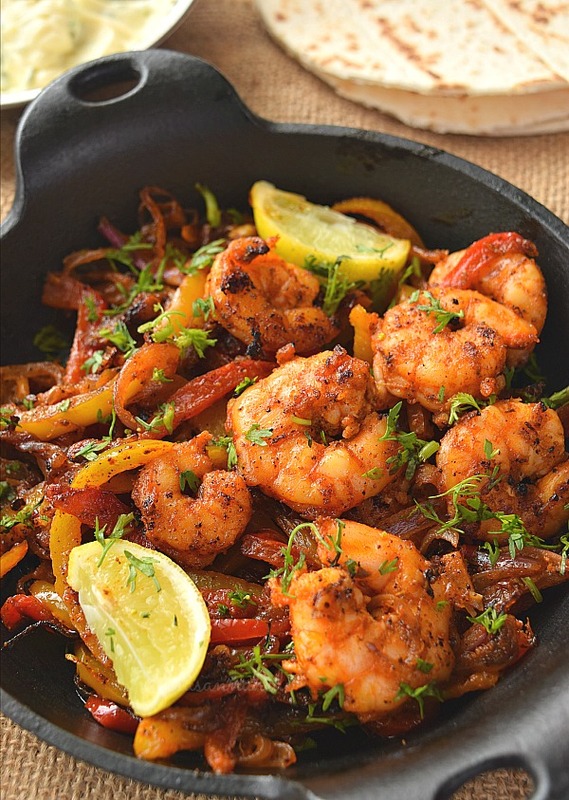 On a skillet,spray some olive oil and spread the shrimp and vegetables mix in a single layer. Cook till the veggies are slightly charred and shrimp is darkened/blackened. Do not overcook the shrimp or you can first cook the veggies in a single layer and then add shrimp after veggies are almost cooked.That way shrimp will not turn hard. 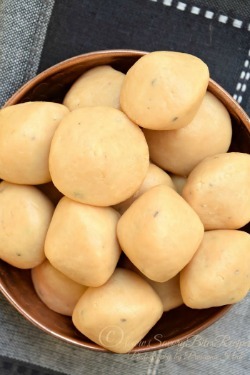 Serve in a flour tortilla or corn tortilla with sour cream +cream cheese topping,lime juice and chopped cilantro. Here I have used a combination of Red and Yellow bell peppers as they are very sweet compared to Green bell peppers,but you can add the Green bell peppers too. I have marinated Shrimp along with peppers and onion in a mix of smoked paprika,cayenne pepper,cajun seasoning,chili powder,onion powder,garlic powder,cumin powder. Use any vegetables of your choice if you want to try variations in vegetables. 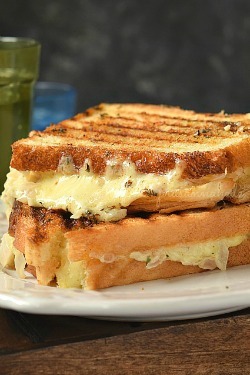 I have used a combination of sour cream and cream cheese,along with salt,sugar.cilantro and lime juice. You can also try adding sliced avocado,sour cream,chopped cilantro also as toppings. 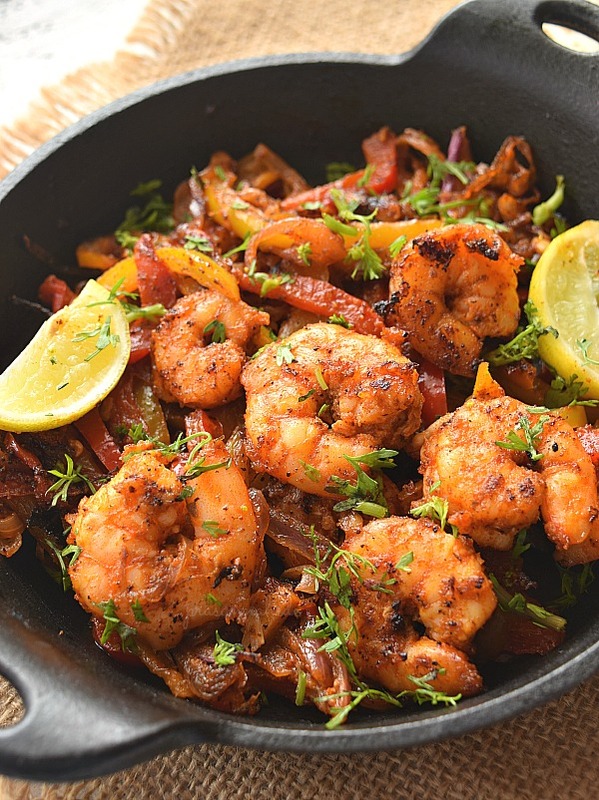 Easy fajitas recipe - Skillet Shrimp Fajitas! very deliciously spicy shrimp cooked with bell peppers,onion cooked in cajun seasoning,cayenne pepper and some more served wrapped in a tortilla/taco shell with sour cream sauce.So many amazing flavors together makes an easy meal. In a mixing bowl,add the shrimp,bell peppers,onion and seasoning mentioned. Add 2 Tbsp olive oil,mix well. 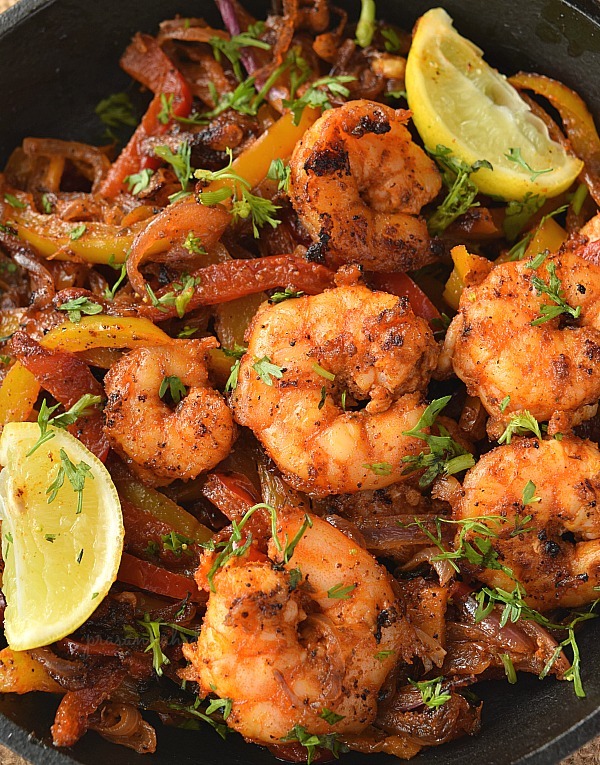 Heat a skillet,add 2 tbsp olive oil,and spread the shrimp mix in a single layer. 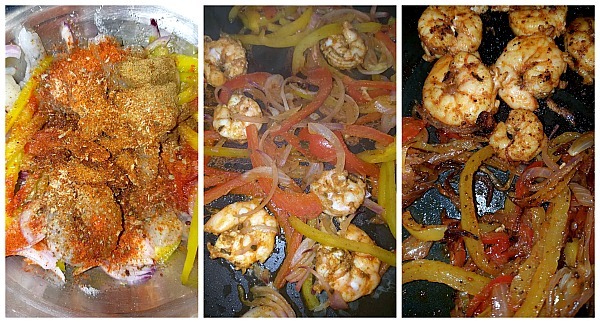 Cook till everything is cooked well and shrimp is blackened. To make the sour cream topping,in a mixing bowl,add the ingredients mentioned and whip/mix well. To serve,place all the tortilla and distribute entire shrimp mix equally on all tortilla top with sour cream topping.